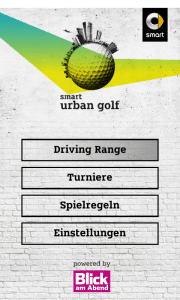 «smart urban golf» is a fun sports app/contest that’s not only made for urban golf enthusiasts. Your smartphone becomes the golf club and the city your golf course. The goal is to sink virtual balls with a swing movement of the smartphone in the holes distributed in the city. On fixed tournament dates, players can compete in different cities to win one of four smart fortwo passion. The app was available for free for iOS in the App Store and Android on Google Play. 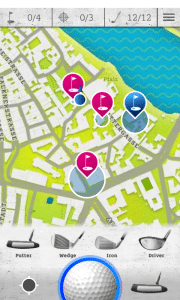 In «smart urban golf», you play golf in the real world with your mobile phone and a virtual ball. There are two modes in the app where you can practice in the driving range mode which generates random courses at your current position. The second mode is a live tournament where participating players compete over their scores on a leaderboard. Gbanga, Millform Inc. developed the complete game app and game server based on an initial idea and designs by JEFF in less than 3 months. The Unity 3D development environment was used. The game is based on Gbanga’s mixed-reality game platform including its game server. 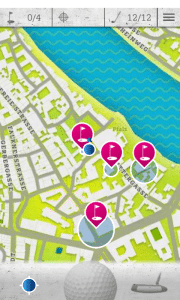 «smart urban golf» is a great example of a new movement: an involving outdoor game that stimulates players to go outside and propagate a healthy lifestyle. The core experience is to practice a known sport in a new way with the mobile phone and its integrated movement sensors.